Lake Okeechobee and the surrounding area has had another couple of weeks of inclement weather and lots of rain. 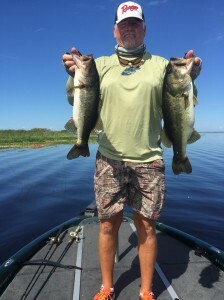 Overall, the fishing on Lake Okeechobee has been pretty good even though the heavy rainfall has caused the water level to be higher than usual. With the higher water levels comes cooler water temperatures in spots that have been home to many of the trophy fish I have caught in the past. The water temps are from 85 – 90 and throughout the lake water clarity is good. The winds has been from the South/East with a mixture of some North wind in the morning.